Fly to Ho Chi Minh City, formerly known as Saigon, then transfer to your hotel. * Check in for a 2-night stay and then relax or take a walk to stretch your legs and begin getting acquainted with the city. Today you will have a rare glimpse of rural life as it has been lived for ages. Begin your morning with a ride on a traditional rickshaw in Tân Châu. Observe the making of floor mats from sedge and slippers from uzu. Afterward, visit the floating fish farm by wooden sampan, then take a boat ride to Vinh Hoa, known as “Evergreen Island.” Here you can take a short walk to see various methods of traditional Vietnamese farming and the crafts and other daily activities of local people firsthand. Dock along the lovely waterfront of Cambodia’s capital and explore the city in style, in a cyclo (the ubiquitous passenger bicycles of Southeast Asia). This mode of transportation provides many Cambodians with a source of income and visitors with a speedy and enjoyable way to move around. See the magnificent Royal Palace with the Silver Pagoda, built in the 19th century by the French but inspired by the centuries-old architecture of the Khmer. Then see the National Museum of Cambodia, which houses treasures of Khmer art and craftsmanship and also displays art that predates the mighty empire. This morning’s excursion takes you through a Cambodian village. After, take a short ride to Udon Monastery for a tour and to receive a blessing by the monks. Then continue to the next village, famous for its silversmiths. Rejoin your ship and have lunch as we cruise into Phnom Penh. This morning, tour this unique Asian capital where old and new combine for an inviting blend in a lush setting of parks and lakes. Visit the Temple of Literature with its maze of courtyards and graceful gateways, an excellent example of traditional Vietnamese architecture. Proceed to the 11th-century One Pillar Pagoda, one of Vietnam’s most iconic monuments, and the nearby Ho Chi Minh Memorial, a vast complex dedicated to the country’s 20th-century Communist leader. Discover silk towns, fishing villages, monasteries and floating markets. Explore Phnom Penh, Cambodia by cyclo rickshaw. Behold the haunting beauty of Ta Prohm, where jungle vines embrace ancient ruins. See the Khmer temple complex of Angkor Wat. Shop Old Hanoi’s markets. 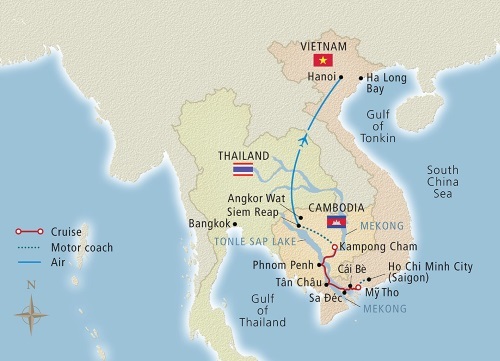 With hotel stays in Ho Chi Minh City (Saigon), Siem Reap and Hanoi bracketing your 8-day Mekong cruise, this 15-day cruisetour reveals the beauty and grace of a land we have only begun to know. Enjoy ample time to explore Bangkok, Thailand’s dynamic capital. Visit ancient palaces, temples, parks and museums; attend a traditional dance and theater performance; or take advantage of world-class shopping. Begin your journey in Southeast Asia with a ride through the verdant farmlands of the Red River Delta from Hanoi to Ha Long Bay, then board a traditional wooden junk for an afternoon cruise and learn about the bay’s features, history and ecosystem.